This entry was posted in Manicure Monday and tagged accent nails, Formula X for Sephora, glitter, gold, LA Colors, red. Do they still have FormulaX at Sephora? I thought it was was discontinued. I loved their polishes though, they wore well on me. And I love red polish. Oh no, I think you’re right! Shows how much I go into Sephora these days. I’ve amended the post. Red and gold is one of my favorite combos. I like it Year round! It’s a bummer they don’t sell them in stores any way! Nice mani, I like the color combo. I love a good red!!! I somehow always think red won’t look good on me and then I wear one because it’s Vhristmas of Valentine’s and I just die over the beauty. This is a really nice red. I like the little sparkle in it. Good manicure for Valentine’s Day! This is a fun combo! like a sparkly tomato! I love it. Red and gold is such a classic combo, I especially love it on the nails! Great combo! Sparkly is my go to look! I love how glitter can really spice up a manicure! Gorgeous mani! I love that you got a polish as a souvenir! I’ve totally done that before. What a beautiful color combination! Red and gold is such a classic combo! 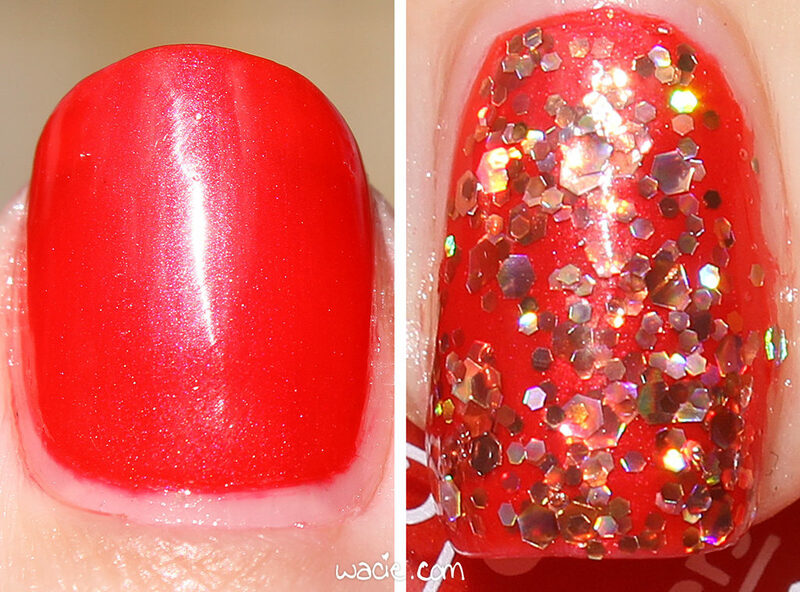 I love a good red polish and you captured the shimmer beautifully! I love that this one looks like a creme at first glance, but there’s microshimmer when you take a closer look. That Sephora glitter is blingy-goodness! Bummer that they discontinued Formula X in-store.